In an increasingly polarized America, it is often too easy to live inside an echo chamber of political thought. This is especially true in colleges across America, where once-civil discussion of political issues can often devolves into shouting matches or violence. We wanted to create a tool to make it easier to broaden your perspective on political issues and better understand opposite viewpoints. 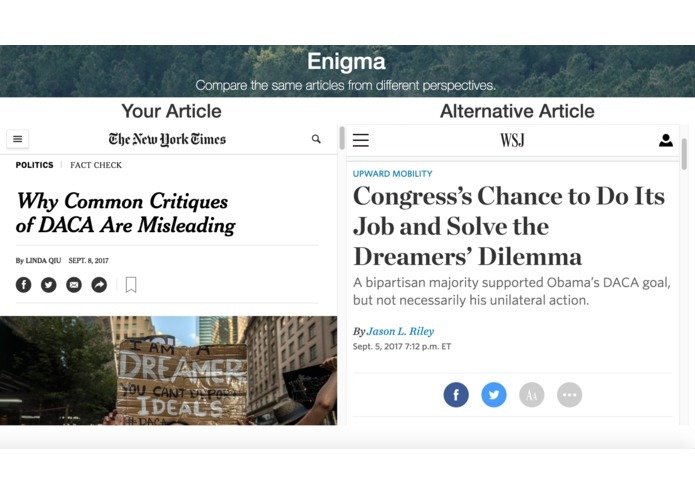 When you are reading a political news article online, you can click the Enigma chrome extension icon be taken to a side by side comparison of your article with a similar article written with an equal amount political bias, but in the opposite direction. For instance, a New York Times article may be compared with a Wall Street Journal article, and a Breitbart article may be compared with a similar HuffPost article. We used HTML/CSS/JS to build the Chrome Extension and comparison page, and we used Node.JS and the Bing API to find appropriate comparison articles. We found it difficult to properly embed news articles on the comparison page due to issues with XSS protections in the browser. It was also challenging to create a convenient flow for users to see article comparisons. 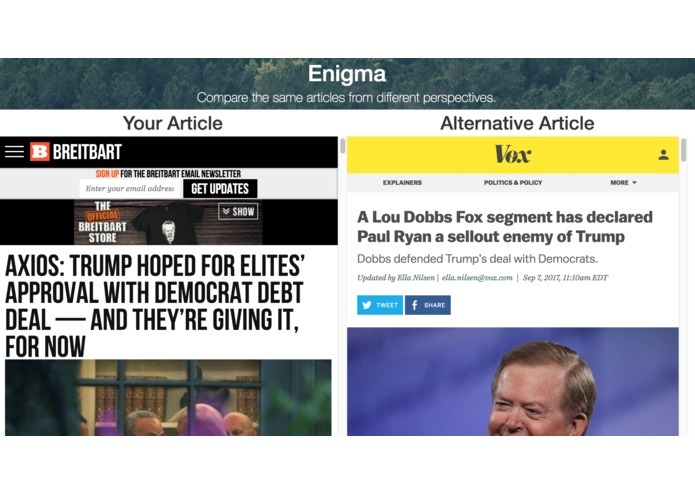 We're proud that we were able to make an easy to use tool that helps broaden your perspective and, in its own little way, fight political divisions and polarization in America. I made the article comparison page. I made the majority of the chrome extension.